Unfortunately it isn’t available in Portugal… yet. Contributor is not yet available in your country. If there’s some way to tweak my settings to enable Contributor but still block most third-party cookies by default, I’d love to hear about it, yep. i tried to signup with Google AdSense in Europe for Contributor, but was unable to find it. Will continue trying and also contact Contributor. Hey. Where’ve you been? Thanks for the info. I’m fond of Mondrian too, but would more likely opt for an image of pie! Unfortunately, it’s still not yet available for Google Apps (Free) accounts. Good idea, but won’t it increase the bid price for businesses looking for customers? Since it would be removing portion of audience and businesses would be competing with users and their competition. Result would drive up the prices per bid. Supply and demand. I think a better idea would be to offer something similar for subscription type services like news websites, video media websites. Imagine paying $15 to $25 per month for a subscription to use paid websites that otherwise require individual paid subscription and money gets distributed among them based on $=time spent * C (C=complex mathematical equation). I would imagine that it would lower barrier to entry for startups and improve content quality. If it already exists then nm. I do not think that this model will be used by most of the people. But it is a good idea to show the people why they see ads on the web. In the moment it is not more for me. For me it devides the web into poor people ad web and rich people clean web. Sometimes something happens and then the web world changes by itself. Let’s see if this gets a chance. BTW: I do not think that users are willed to pay as much as advertisers do, to get a clean web look. Michael, I’m a big fan of the idea of micropayments, and paying once a month seems like a possible way to reduce transactional friction. That said, I’m also a fan of services/experiments like Patreon, Bandcamp, Indie.vc, and others that represent new ways to support content creation on the web. Not everyone knows about these new approaches. Holy crap, that’s some great results from Patreon and Bandcamp! Like you said, I had no idea they existed. That some searching for torrents were buying at Bandcamp is more exciting. Thanks for the reference! I’ll pass it along. So you pay to make the unobjectionable part of ads (the images) go away, while the objectionable part (google tracking you) stays? Having worked at Google for 15+ years, I’m not concerned about Google’s JS, because I trust them. But this solution is orthogonal to any blocking you wanted to do of domains that you don’t trust. Good one. One downside is that the tracking is even more severe that way. But I guess you knew that. Again, another “pay for less annoyance” service. But there is a waitlist! You should update your FAQ here to say this is US only. It’s safe to assume that the Contributor team have heard the requests to support this outside the US, but with luck they’ll read this comment too. For me adblocking is about blocking tracking not blocking adverts. Can I pay Google not to track me? They can show me as many ads as they like (p.s. I don’t count ‘opting-out of being shown personalised ads’ as not being tracked). This is the opposite of what a lot of adblockers want. Why should the audience be required to support and industry they don’t appreciate? That’s like having an advertisement in the train station that people walk by without acknowledging, and charging them a fee to walk a path around the ad. Adblocking is a defensive tactic, this is an offensive tactic. Looks interesting, though it’s hard to imagine the real incentive here. Also, Matt, your report shows more than $10 — is that one months report or several together? Just curious is all. That’s for several months together. Where is Contributor available? – Contributor is available in the U.S. only at this time. And every so often people ask why? I’ve been using it and I really like it. I wish it would actually collapse the ads, but it’s still better than having to actually see them. does it work on youtube? A lot of the sites I go to are sites that I am going to for the first time. What if I don’t want to support a certain site? Does Google Contributor automatically contribute on my behalf without me getting to decide? I believe in the Advanced settings, you can configure Contributor only on specific sites that you select. For me, I prefer to use Contributor everywhere though. Kevin, I believe the HTML that you can insert instead of an ad is quite fast, which helps with #1. With #2, you could still decide whether you wanted to use something like Disconnect to disable some trackers you disliked. I’m curious re your comment about tracking. Can you tell me why? Do you know of any benefits from allowing yourself to be tracked online? When will Contributor be available outside of the US? I’m in Canada. How does this handle multiple accounts? I just signed up using one of my three accounts – it’d be really nice if there was a way to recognize that, say, a work or organization account belongs to the same person who signed up to Contributor using a personal account. Chris, that’s a good question. I’m not sure how Contributor handles this, but I’ll try to ask. Personally, I use Contributor with the account that’s my default profile for surfing the web. Do you use multiple accounts? When you signed up for Contributor, you associated it with one of those accounts. In order for Contributor to work, that Google account needs to be the first one you sign in with while browsing. If you’re not sure which account you signed in with first, take a look at your browser’s address bar: when you are logged in to the first account on any Google product, the URL will contain “/u/0/” (this only shows if you are signed in to multiple accounts). To change the order of accounts, sign out of all your accounts, and sign back in, using your Contributor account first. Learn more about signing into multiple accounts at once. That’s a much better explanation, but I basically signed up for Contributor with the default account/profile that I use when surfing the web. Don’t most ad buyers specify some fixed amount of views that they want to achieve, either explicitly or implicity by specifying maximum prices and a budget. Won’t this just either A) drive the cost of ads up in general, and B) drive the overmonetization of page space by encouraging the less scrupulous to ramp up the number of ad blocks to meet demand for views? Do you have any plans to allow a device-type bias? Since mobile ads are so much worse, I’d love it if I could bias ad replacement towards page-views on my phone than my desktop. Eh, regarding the waitlist, you’re not entirely correct. It’s not open outside the US, as far as I can tell (when I visit the site, I only get the waitlist, with a message that only people with a credit card from the US can access it). Ole, that’s a good point. For now, you still need a US credit card to use Google Contributor. I know the team is aware of requests for access outside the US, so I hope they’re working on that. Very nice thos new tool. But for we as publishers, it will be better? 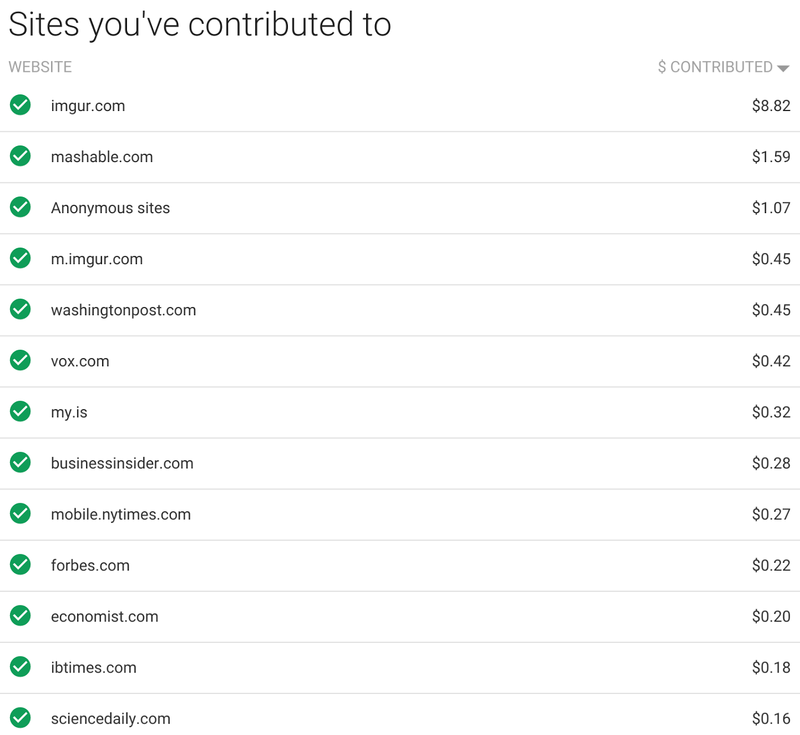 How much money does google take from contributor ? Are the economics better than adwords ? Yeah interesting point – am I correct in understanding Google still earns it’s fee? Is there anything similar available for youtube video ads? More than any text ad, the video ads on youtube are what I’d like to be able to skip with a contribution. Great post. Thanks for the info! This is very similar to Adieu. If anyone wants to try it, I believe they offer a free trial. (FYI. I’m not affiliated with Adieu, but think they and Google Contributor are cool technologies) . I like the idea of chipping in, but I see that privacy / blocking extensions I am running appear to stop Contributor from recognizing me… I don’t see anything in the FAQ about what would happen if no visits of mine were matched in a month (whether that was due to my blocking, or sailing across the Pacific solo and being afk). Toby, someone on the Contributor team actually pointed me to these two resources to answer that question: https://support.google.com/contributor/answer/6182619 and https://support.google.com/contributor/answer/6182623 . Hope that is helpful! Thanks, Matt. That does help – but it looks like unless I do a bunch of manual whitelisting, my monthly contribution will just pile up. Hmm. Or just build ads that can’t be blocked. There’s no such thing as a blocker that can’t be circumvented. what would have better, is if I pay, I would like to see my ads show up for everyone, even local, ie, if I win the bid for that spot, it is great way for smaller mom&pop players to compete with big boys. GS, I’m not sure I understand this comment. I believe what Contributor does is just bid in the auction on your behalf: https://support.google.com/contributor/answer/6182617?hl=en So I don’t expect this to lead to a massive inflation in the CPM; to me, it’s more like you’re just paying the market price, but you get to show what you want in the ad space? To give money to “see fewer ads”? LOL! No thank you, I’ll never disable my adblock and I’ll keep installing it on every single PC. Oh wow someone should have done this years ago. This is like the Public Radio model for the web! I’d love to try it out but there’s no option to choose with Apps account to link to billing. Is there an API for Contributor? I think it would be interesting to dynamically update the ads to show motivational messages. Well, Contributor just includes some HTML from a URL that you can pick. So that URL could do any wild/dynamic thing you wanted. Thanks, Matt! I have been waiting for this to come to Apps accounts. Thanks for specifically addressing that. Matt: is there a way we can access it from outside the U.S.? On invitation, perhaps? I agree that webmasters should be given with some contribution from their users if they use Adblock services! It’s a great start and I would go with it! This is interesting. Any feedback yet? Unfortunately, I am also unable to Contribute from my country. The idea is very noble – contributing to favorite sites. Another route that I am seeing is lot of tech blogs asking for monetary help on Patreon and raising monthly recurring funds. Can independent publishers have both Patreon and Google Contributor program? Please clarify. but how to kinding the ID ? I think this is a great idea and I would love to try Google Contributor. When will it be available worldwide? Pretty good piece. Ingenious idea. As usual cue the why didn’t I think of that comment! With continued rising installation of adblock around the globe, this thing may save adsense. The people who are so sure they don’t want to see ads have an alternative now. Lets hope for the best. I like the idea to contribute to the sites I visit and not see or see less ads, however I find that the online experience without AdBlock (uBlock) is horrible, I still want to use an adblock and also contribute, is that possible? If you use an adblock then it sounds like the sites don’t get anything even though you pay Google Contributor. Thank you Matt! I have been waiting for this to come to apps accounts. Nice days! i would love anyone’s feedback on if they agree or not. Great interesting but my country not available. I never disable adblock and I keep installing it on every my pc. I think it’s a nonsense to PAY for getting FEWER ads. I’d appreciate paying for no ads at all. I’d like to support sites I like. But Google is trying to sell ways for spamming my consciousness with various garbage. So for now, Adblock and others seem to be the only reasonable choice for avoiding going mad. I just signed up for Contributor. It’s great Google is trying this. We need to do something to keep advertising in check. The only way this will make a meaningful difference is if a lot of people sign up. This is a start. is this effects people whom running AdSense, there revenue will increase or decrease? and what about people whom use Adwords to promote there company?